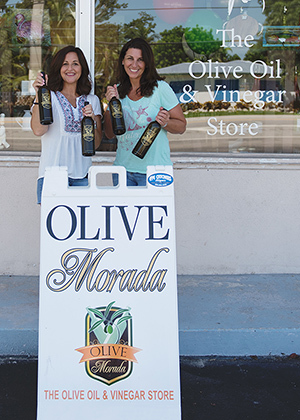 Olive Morada established in 2013 has always offered the finest and freshest imports of Extra Virgin Olive Oils and Vinegars as well as other gourmet foods and unique gifts. In August 2018 two local friends decided to purchase the business from the original owners and they are excited to enter into this new venture with fresh ideas and enthusiasm. Jen White is married to Kevin; a General Contractor and Navy Veteran and they have a beautiful daughter who is away at college at University of North Florida, in Jacksonville. They moved to the Keys from Ft. Myers 3 years ago and absolutely love all the local activities like fishing and diving. Jen loves to bake and come up with creative ideas to make her home feel cozy and a welcome place for friends and family to enjoy. Ask her about the year her family spent in Belize working with children shelters. Jenn Miller has lived in the Keys since 1996 and raised her 21-year-old daughter here, who is currently attending Florida State University in Tallahassee. She is engaged to Joe, who owns a local insurance company. Together they have 4 children that keep them busy, but do enjoy volunteering, taking family trips and a day out on the boat snorkeling, spear fishing or just collecting shells. Together, they bring their love of all things "super cute" to this small Islamorada shop. They are excited to learn more and more about the olive oil world and all the delicious possibilities that you can whip up in your kitchen. Every day, a new tasting is available at the store, so stop by to try some delicious recipes created by the owners.